Founded in 2003 Duplay is a stockist of children’s outdoor activity toys. They sell a comprehensive range of Swing sets, Trampolines, Sand Pits, Climbing Frames and much more. Prices are very competitive with extra discounts by using our Duplay free delivery codes and voucher codes. Duplay equipment is also supplied to leading companies such as Smyths Toys, Asda and Tesco. Duplay, part of Plastoy limited is one of the largest suppliers of outdoor play equipment such as popular trampolines, play inflatable’s, with features such as slides and water play. 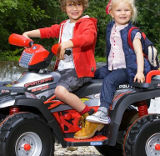 There’s a selection of ride on toys and scooters, garden furniture, garden sports and sandpits. Duplay is the only UK distributor of the Happy Hop range of bouncy castles with water slides, made for home use only. Why rent a bouncy castle when you can own of your own to use year after year at any time at an economical cost. All Duplay’s inflatable’s are easy to set up within minutes and are constantly inflated so there is no worry about losing pressure even with pin holes present due to the permanent inflation. Duplay have a reliable delivery service which does it utmost to provide free delivery within 1 working day. For UK mainland delivery the quoted delivery is 1-3 days but in most cases the product will be delivered in the minimum time however this is dependent on the carrier. Scottish island, Ireland and Northern Ireland, Channel and Scottish Islands delivery is normally 2-4 days. Contact Duplay for all international shipping options. Items can be returned to Duplay within 14 days of original purchase. Customers will need to ring Duplay in advance on 01482 351 279 or by email to get return authorisation than print and fill out a returns form for inside the box. All you then need to do is send the product to the returns address or arrange a collection which is chargeable from the returns cost. All returns must be unopened and in the original packaging. See the Duplay website for full details.